When life on Earth began nearly 4 billion years ago, long before humans, dinosaurs or even the earliest single-celled forms of life roamed, it may have started as a hiccup rather than a roar: small, simple molecular building blocks known as "monomers" coming together into longer "polymer" chains and falling apart in the warm pools of primordial ooze over and over again. Or so the story goes. But with no fossil record to check from those early days, it's a narrative that still has some chapters missing. One question in particular remains problematic: what enabled the leap from a primordial soup of individual monomers to self-replicating polymer chains? "We tried to fill this gap in understanding between simple physical systems to something that can behave in a life-like manner and transmit information," said Alexei Tkachenko, a researcher at Brookhaven National Laboratory. Tkachenko carried out the research alongside Sergei Maslov, a professor at the University of Illinois at Urbana-Champaign with joint appointment at Brookhaven. Self-replication is a complicated process — DNA, the basis for life on earth today, requires a coordinated cohort of enzymes and other molecules in order to duplicate itself. Early self-replicating systems were surely more rudimentary, but their existence in the first place is still somewhat baffling. Tkachenko and Maslov have proposed a new model that shows how the earliest self-replicating molecules could have worked. Their model switches between "day" phases, where individual polymers float freely, and "night" phases, where they join together to form longer chains via template-assisted ligation. The phases are driven by cyclic changes in environmental conditions, such as temperature, pH, or salinity, which throw the system out of equilibrium and induce the polymers to either come together or drift apart. Polymers can also link together without the aid of a template, but the process is somewhat more random — a chain that forms in one generation will not necessarily be carried over into the next. Template-assisted ligation, on the other hand, is a more faithful means of preserving information, as the polymer chains of one generation are used to build the next. Thus, a model based on template-assisted ligation combines the lengthening of polymer chains with their replication, providing a potential mechanism for heritability. While some previous studies have argued that a mix of the two is necessary for moving a system from monomers to self-replicating polymers, Maslov and Tkachenko's model demonstrates that it is physically possible for self-replication to emerge with only template-assisted ligation. "What we have demonstrated for the first time is that even if all you have is template-assisted ligation, you can still bootstrap the system out of primordial soup," said Maslov. The idea of template-assisted ligation driving self-replication was originally proposed in the 1980s, but in a qualitative manner. "Now it's a real model that you can run through a computer," said Tkachenko. "It's a solid piece of science to which you can add other features and study memory effects and inheritance." Under Tkachenko and Maslov's model, the move from monomers to polymers is a very sudden one. It's also hysteretic — that is, it takes a very certain set of conditions to make the initial leap from monomers to self-replicating polymers, but those stringent requirements are not necessary to maintain a system of self-replicating polymers once one has leapt over the first hurdle. One limitation of the model that the researchers plan to address in future studies is its assumption that all polymer sequences are equally likely to occur. Transmission of information requires heritable variation in sequence frequencies — certain combinations of bases code for particular proteins, which have different functions. The next step, then, is to consider a scenario in which some sequences become more common than others, allowing the system to transmit meaningful information. Maslov and Tkachenko's model fits into the currently favored RNA world hypothesis — the belief that life on earth started with autocatalytic RNA molecules that then lead to the more stable but more complex DNA as a mode of inheritance. But because it is so general, it could be used to test any origins of life hypothesis that relies on the emergence of a simple autocatalytic system. "The model, by design, is very general," said Maslov. "We're not trying to address the question of what this primordial soup of monomers is coming from" or the specific molecules involved. Rather, their model shows a physically plausible path from monomer to self-replicating polymer, inching a step closer to understanding the origins of life. Nearly every culture on earth has an origins story, a legend explaining its existence. We humans seem to have a deep need for an explanation of how we ended up here, on this small planet spinning through a vast universe. 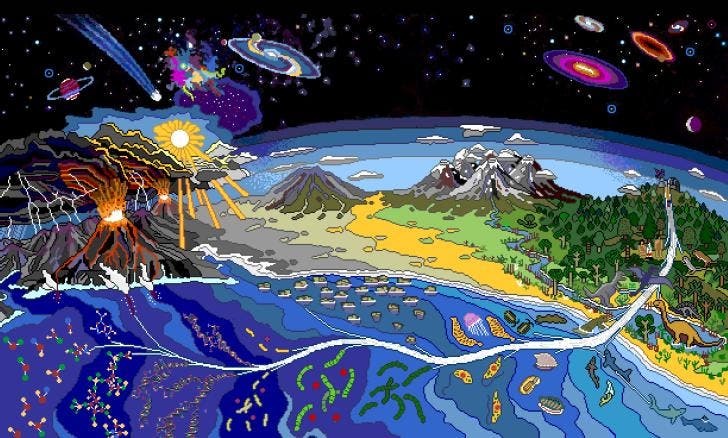 Scientists, too, have long searched for our origins story, trying to discern how, on a molecular scale, the earth shifted from a mess of inorganic molecules to an ordered system of life. The question is impossible to answer for certain — there's no fossil record, and no eyewitnesses. But that hasn't stopped scientists from trying. When Charles Darwin published his seminal On the Origin of the Species in 1859, he said little about the emergence of life itself, possibly because, at the time, there was no way to test such ideas. His only real remarks on the subject come from a later letter to a friend, in which he suggested a that life emerged out of a "warm little pond" with a rich chemical broth of ions. Nevertheless, Darwin's influence was far-reaching, and his offhand remark formed the basis of many origins of life scenarios in the following years. Oparin's writing eventually inspired Harold Urey, who began to champion Oparin's proposal. Urey then caught the attention of Stanley Miller, who decided to formally test the idea. Miller took a mixture of what he believed the early earth's oceans may have contained — a reducing mixture of methane, ammonia, hydrogen, and water — and activated it with an electric spark. The jolt of electricity, acting like a strike of lightening, transformed nearly half of the carbon in the methane into organic compounds. One of the compounds he produced was glycine, the simplest amino acid. The groundbreaking Miller-Urey experiment showed that inorganic matter could give rise to organic structures. And while the idea of a reducing atmosphere gradually fell out of favor, replaced by an environment rich in carbon dioxide, Oparin's basic framework of a primordial soup rich with organic molecules stuck around. In the 1960s, three scientists — Leslie Orgel, Francis Crick and Carl Woese — independently suggested that RNA might be the missing link. Because RNA can self-replicate, it could have acted as both the genetic material and the catalyst for early life on earth. DNA, more stable but more complex, would have emerged later. Today, it is widely believed (though by no means universally accepted) that at some point in history, an RNA-based world dominated the earth. But how it got there — and whether there was a simpler system before it — is still up for debate. Many argue that RNA is too complicated to have been the first self-replicating system on earth, and that something simpler preceded it. Others, taken more seriously, suspect that RNA may have emerged in concert with peptides — an RNA-peptide world, in which the two worked together to build up complexity. Biochemical studies are also providing insight into simpler nucleic acid analogs that could have preceded the familiar bases that make up RNA today. It's also possible that the earliest self-replicating systems on earth have left no trace of themselves in our current biochemical systems. We may never know, and yet, the challenge of the search seems to be part of its appeal. Today's 'Galaxy' Insight –"Beyond the Big Bang"